Photo Credit: Chesapeake Bay Sport Fishing, LLC. 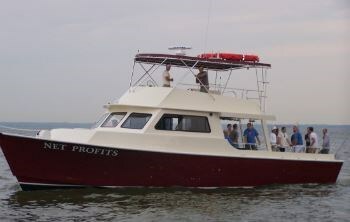 A full-time operation offering private charters only. Choose from one of several fishing boats. Max charter size is 6 people, with several vessels rated for 8 or 10. Excellent day catching stripers! Caught our limit by 9, Captain recommended a place close that cooked it for us for lunch! We caught many fish. Captain Bernie and first mate Alex were great and provided terrific service. We will never forget this wonderful fishing trip and the many hook ups we encountered.